Sometimes reading blogs can be expensive: you read, you like, you must have… the purchase is a direct result of reading a particular post. Other times, I’ve noted indirect references to an artist rated highly by the writer and somehow added a pencil note to the old cerebral cortex. An example is the band Earth, alluded to by Victim of the Fury on a couple of occasions in recent months. Knowing his liking for the guitarier end of the musical spectrum, I sort of assumed Earth were a metal band of the, er, earthy variety. Nevertheless, when I saw one of their albums during a recent browse, I opted to take a punt. On reflection, I think this had as much to do with appreciating Victim’s posts and an interest in the writer as any particular vibe about the music, but I bought it anyway and felt quite a thrill as I loaded CD into player; it’s been a while since I’ve played something totally new and unknown. So, in honour of Mr VotF, currently walking like an Egyptian, Vinyl Connection ventures into the genre Allmusic calls ‘ambient metal’ and ticks off both ‘Explorer’ and ‘Researcher’ categories in one fell swoop. It is all there in the initial seconds as the first elemental chord crashes out of the speaker and you lean forward, waiting for the second chord, for the resolve, the tension release, the skull-cracking blow. This is big. Huge. And very, very slow. Yet painting a picture of gloom and brutality is neither fair nor accurate. In “Miami morning coming down II (Shine)” —there are no words in the songs but plenty in the titles— a brief guitar figure showers notes like gargantuan crystal bells while organ adds fluid flow underneath. (Listen) It’s a giant stirring to greet this warm Spring morning and the ground trembles in anticipation… he’s in a good mood. “Engine room” opens with deep piano notes, which is quite surprising given the amped up guitar accompanying the keys, but amply demonstrates the beautiful mix on The Bees Made Honey. This is also one of three pieces that feature Bill Frisell on extra guitar. As if Earth needed more guitars. But Frisell is in terrific form, blending notes, effects and noise into a stew that is always thick but never glutinous. It is a lot of noise for a trio, especially considering that percussionist Adrienne Davies clearly graduated from the Moe Tucker school of minimalist drumming. But when you think about it, the whole band is a rhythm section: guitar, bass, drums, keyboards. No soloing as such, more shifting, chiming sheets of sound based around the “electric guitars and amplifiers” of Dylan Carlson. It is utterly fitting that the amps are given instrument status. A word about the CD package of The Bees Made Honey in the Lion’s Skull. We vinyl tragics can be quite sniffy about the poverty of the visual experience with little silver discs but Earth have done a thoughtful and creative job here. The none-more-black outer slipcase promises relentless darkness, yet removing the jewel case reveals Arik Roger’s striking cover art, a riot of fecund decay. It manages to be both beautiful and slightly disturbing. Although I was a little weary of the lumbering key largo waves by the end of seven substantial tracks, I enjoyed this album very much. It may be all adagio ponderoso but there is an authentic commitment to uncovering beauty in these deep roiling oceans of sound. In the right mood, you can immerse yourself in a monumental unfolding. There is life on Earth. And now, to complete a Grand Day Out, we’re leaving Earth for the moon. At the beginning of this piece I referred to direct purchases: albums sought and obtained as a direct result of reading a fellow blogger’s review. 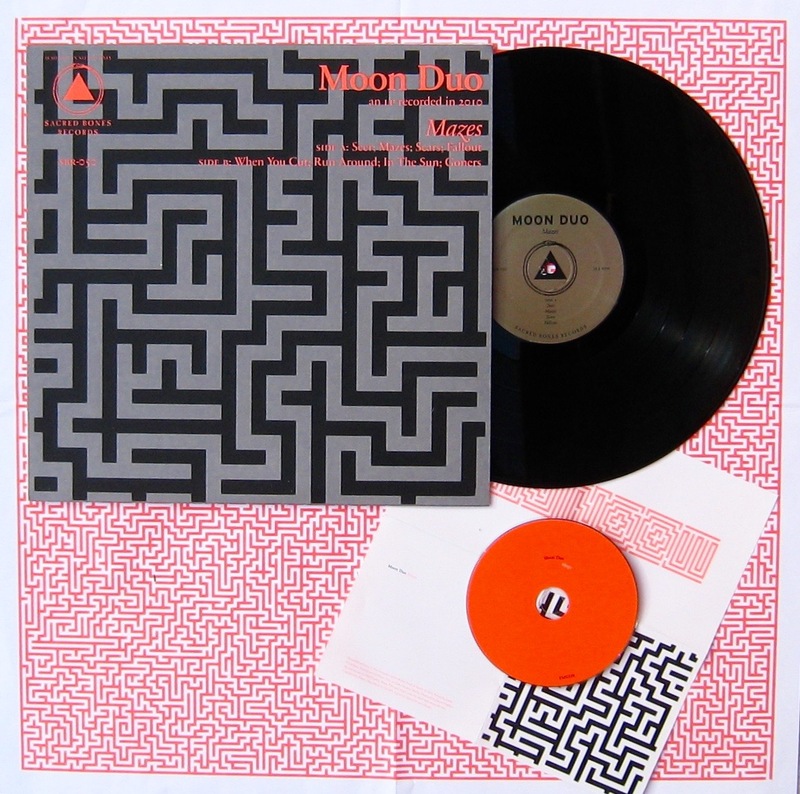 A case in point was when I read Mr 1537’s account of the Moon Duo album Mazes. Sounded interesting to me. So much so that when I encountered the CD — with a bonus disc of remixes to boot! — I snapped it up. Liked it too, though I spent little time with the remix album. You have to know the originals pretty damn well to derive much pleasure from these (often indulgent) spin-offs, don’t you? You’ll notice I said that I ‘liked’ Mazes, as compared with, say, fell madly in love with it and played it constantly for 7 nights and days. The latter is a pretty rare reaction these days, not due to jaundiced ears, more the sheer quantity and variety of different music that mysteriously appears at the Vinyl Connection bunker. Even the most exciting new arrivals tend to get spun then shelved. Anyway, something positive must have piqued the old musical pleasure centres, as I did not hesitate a lunar second when I saw a vinyl copy of Mazes on special earlier this year. I liked it a lot when I span the vinyl and I liked the huge orange maze too. Though I’ve kept the latter hidden from the boy and his pen. So I decided to write about another purchase influenced by a fellow blogger (as distinct from further exploration of those Vinyl Hunter-Gatherer Categories) and I was drawn to something beamed from 1537-land. This is the one I chose. It’s spinning on the turntable now, in all it’s garage-psych lowish-fi glory. Churning out simple but infectious grooves, it’s cut-price Velvet Underground aesthetic daring you to put up yer dukes and fight it out, then winking and cheekily pinching your bum. Perhaps it was the grinding glory of Earth that somehow infiltrated my cranial music library, or maybe the long-distance motorik beats of Neu! playing in the car today, because there is a relentless quality to Moon Duo too. Even Ripley Johnson’s voice is droney. The guitar sound —grungy and nudging distortion— varies little across the album, though Johnson’s solos are marvellous; extended workouts that soar like home-made rockets and remind me of Nick Saloman, who, as Bevis Frond, has been building guitar-based psychedelic rockets in his UK garden shed for years. I enjoy Bevis Frond songs more (Nick has a fine ear for both melody and hook), but that takes nothing away from Mazes. The phrase ‘jaunty claustrophobia’ was used by Joe and an apt description it is too. I really enjoyed Moon Duo this time around. They’ve got a niche and they scratch it. Enthusiasm, Desperation, and enduring Scrooge-ness — 3 further categories examplified. I loved the way the bass vibrated through my keyboard while I tapped away as I listened to Earth’s ‘Miami morning coming down II shine’ then The Driver. Not sure how I’d cope with seven momentous tracks in a row, but thanks as always for the primer, VC. So the world moved for you, did it DD? The vibrating keyboard is a fantastic image. Yes, I found it a solid meal too, but interesting and enjoyable none-the-less. And thank you, as always, for dropping by. I really like those Earth LPs too, not that I listen to them very often mind. Ever tried any Sunn O))) ? Thank you very much indeed for the big mention and please apologise to your better half for eroding the Connection household budget, yet further. The big maze justifies the vinyl price, I reckon. I love Moon Duo, especially live – they’re relentless. Ripley is such a good, tasteful guitarist. The track for me on Mazes is ‘Seer’, perfect music for a nighttime drive. Have recently been delving into sunO))) as well. Picked up an album called White 1 (that has Julian Cope disclaiming at length) – hasn’t captured me yet. Also bought a vinyl monster they made with Japanese noiseniks Boris that has yet to reach the turntable. Watch this space. You’re welcome with the links – I sometimes don’t connect with the music but always enjoy the ride. 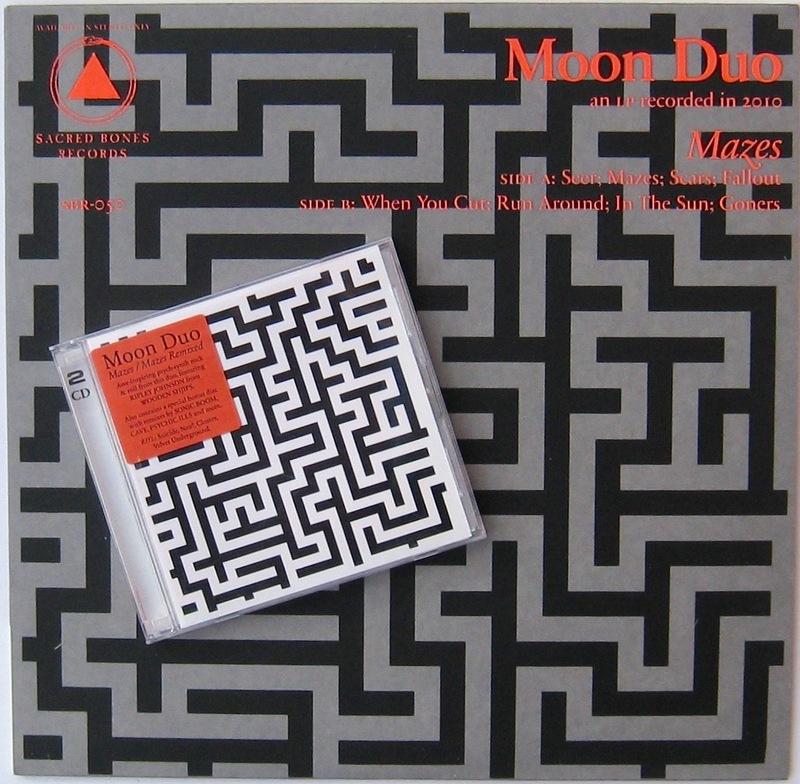 As for Moon Duo, I have Circles too, but think I slightly prefer the earlier one. Good luck with Aja, but do also keep an eye out for Countdown to Ecstasy. Gotta love it, eh? Bang your head to sleep. 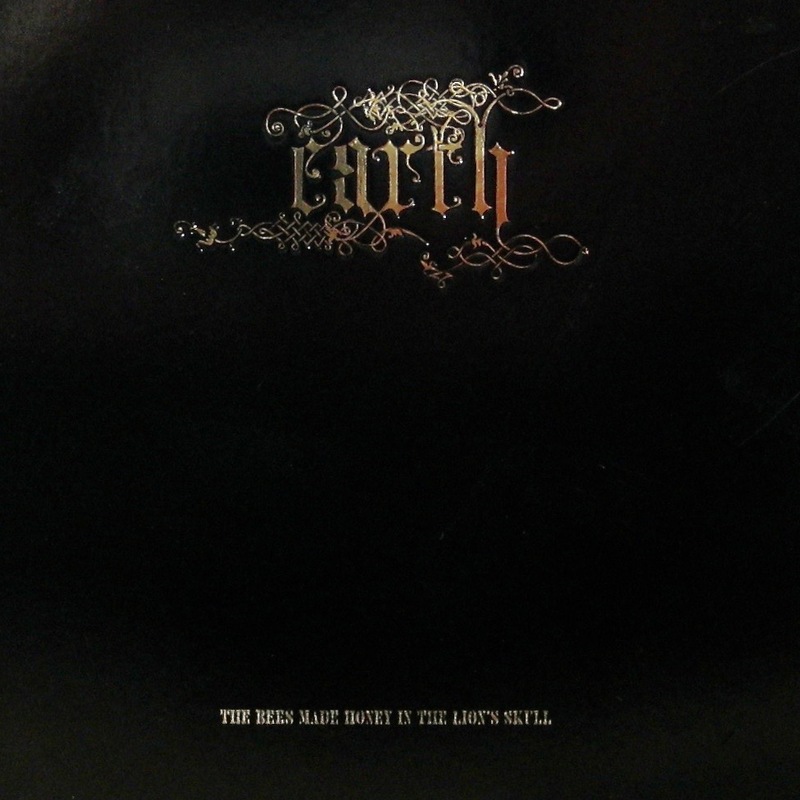 Funnily enough, my then 12-year-old son actually used the “Earth 2” album — which is much more drone-y and lumbering than the latter-day Earth offerings and which I don’t necessarily recommend — as white noise to put himself to sleep at night for a period many years ago. Great post, VC. Can’t comment (yet) on the disks but your descriptions are wonderful. “well-ordered chaos”, “gargantuan crystal bells”, “a riot of fecund decay”. Brilliant! I’ll have to check out Earth – I can’t imagine what “ambient metal” sounds like but your recommendation is good enough for me. Thanks a lot Mr B. I love the challenge of trying to write evocatively about something perhaps unfamiliar. There is Earth material on the Tube of You if you can tolerate that digital form (linked in the text above). If you check it out in some form(at), I’d be interested to know your reaction. Glad you enjoyed it Matt. I was a little nervous too – but not really spooky at all. I think those two poles you mentioned in terms of critical response are apt: metal and avant-garde but even that sells it a little short. Be interested to hear how you respond if you get to listen further. Dylan Carson was the friend who bought Kurt his gun. Now when I ‘Like’ that comment I am certainly not endorsing anyone buying firearms for anyone else. Ever. JHMFC. So very true, this blogging is a surprisingly expensive hobby! Great, descriptive comment on a band and genre that can be hard to capture. Much appreciate the mention and kind words also. Been finding it a little hard to post of late — not for the first time in my blogging career (smile) — but being reminded by your wonderful entry of the connection(!) and sharing relationships that arise from the exchange certainly makes me want to become more active. Based on your positive initial experience with this Earth offering, I’m willing to predict comfortably that you’d like the three albums that followed this one as well should any of them appear in your sights during a future hunting/gathering expedition and you find yourself with room in the bag. I’m very glad you enjoyed it V. And if a quiver of interest in taking up the digital pen results, then that’s a very good thing too. It can be revealed that I have ordered another Earth album – on a proper medium this time. Looking forward to its arrival. Great post, Bruce. 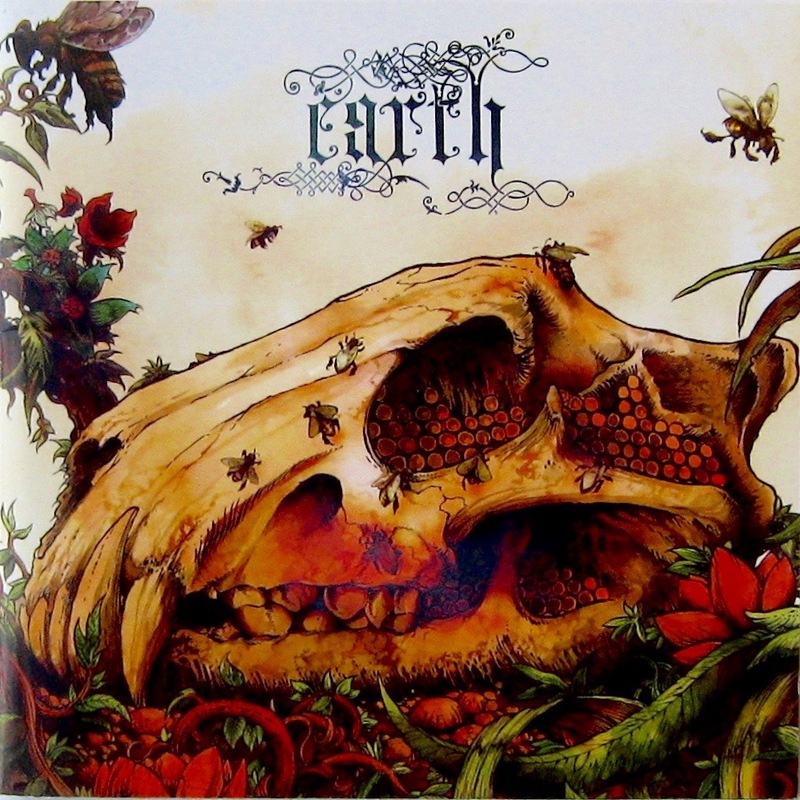 Really fond of Earth – particularly their output over the last 10 years. This is an all-timer, though. Saw them play during this tour and it was hypnotic. Slow gigantic riffing and the slow-motion drums. Truly wonderful. What’s the other Earth album you’ve purchased? Thanks James. I’ve been doing so much late night Vinyl Webcrawling that I had to look it up! Primitive and Deadly is the one. A good choice I hope! Some of those dangerous ‘J’ qualities, eh? Primitive and Deadly is a very fine choice, Bruce. I recently purchased that on vinyl, too. It’s a bit meaner and more sinister sounding. Nice and scuzzy, too … and some vocal shenanigans, y’know. … and side D. Oooft. I’ll look forward to your thoughts on it!